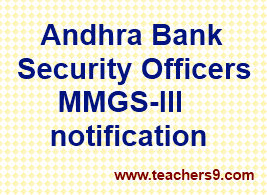 Andhra Bank a leading Public Sector Bank invites applications from Indian citizens for the Post of Security Officers in MMGS-III.The complete details of age limit, educational qualification, selection process, application fee & how to apply are given below. Andhra Bank, Head Office, Hyderabad has announced a notification for the recruitment of Security Officers in MMGS-III vacancies.Eligible candidates may apply online from 03-06-2016 to 13-06-2016. Age Limit: Candidates age should be minimum 21 years & maximum 40 years as on 30-04-2016. Age relaxation is 3 years for OBC, 5 years for SC/ ST & Other candidates as per Government Guidelines. Selection procedure will be by way of Interview.The Candidate has to secure minimum marks of 40% in the interview to be eligible for selection. Candidates must submit the following certificates in original along with one set of attested copies at the time of appearing for the interview, failing which his candidature will be canceled. Certificates in support of educational qualification , date of birth and caste. SC/ST Caste Certificate issued by the Competent Authority. a)Candidates can apply online from 03.06.2016 to 13.06.2016 through the link in the careers page of the Banks website (www.andhrabank.in) and no other mode of application will be accepted. Keep the necessary details of Educational Qualifications and other personal details handy for entering the online application. Create a valid personal email ID, if not already done. The email ID should be kept alive for the entire duration of the selection process.Under no circumstances, the applicant should share email ID with any other person.Third party email ID is not permitted. I would like to know your opinion on data room providers . Thanks in advance for your reply!